Los Angeles, CA…October 19, 2010…Ciralight Global, developer and manufacturer of patented Smart Skylights™, announced that it has entered an agreement with Denver–based AIA Industries, Inc. a major manufacturer of plastic and structural glass skylights to be a dealer and sell Ciralight Global’s energy saving Smart Skylights. Energy Saving Smart Skylights allow users to shut off electric lights up to 10 hours a day. Jim Donaldson, President of AIA, remarked, “Ciralight's Energy Saving Smart Skylights, with their ability to drive natural light into buildings, are the future for “Green” commercial buildings, schools, factories, public facilities and retail stores. 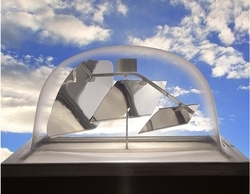 Ciralight Global, developer and manufacturer of patented Smart Skylights™, announced that it has entered an agreement with Denver–based AIA Industries, Inc. a major manufacturer of plastic and structural glass skylights to be a dealer and sell Ciralight Global’s energy saving Smart SkylightsTM. “AIA Industries is a long time leader in the skylight industry and we consider their decision to sell our Smart Skylights™ in addition to their own products to be a significant development for our Company,” Jeff Brain, President and CEO of Ciralight, said. Ciralight Global's Smart SkylightTM products, are a solar powered lighting solution that allow users to shut off their electrical lights for up to ten hours a day. As a Green product they are eligible to receive federal, state and local tax credits and utility incentives. In addition to significant energy and cost savings, the benefits from Smart Skylights™ include better worker performance, increased sales, and a reduced impact on the environment. Ciralight’s customers include certain outlets of Giant Foods, Office Depot, Ace Hardware, Emerson, Boeing, Johnson & Johnson, Staples, Whole Foods, Walt Disney Studios in cities such as San Diego, Los Angeles, Salt Lake City, Las Vegas, San Francisco, Portland, Atlanta, Columbus, Kansas City, Phoenix, Jacksonville, St. Paul, Dallas, Austin, and Albany, NY, and throughout the United States, and locations in Europe, South America, Canada, Mexico and Asia. Ciralight Global, Inc. headquartered in Corona, California, developed their energy saving Smart SkylightsTM to bring natural daylighting indoors using their patented GPS technology and mirrors that track the sun. Smart SkylightsTM allow users to shut off their electric lights for up to 10 hours a day during the daylight hours. The result is a FREE natural source of light, which will save energy, lower utility bills, improve customer and employee satisfaction while enhancing performance in schools, factories and businesses that use the system. With the worldwide movement toward a greener planet, Ciralight Global, Inc. is moving forward to make Solar Daylighting a construction industry staple and help millions of people experience healthier, energy saving lighting naturally. Ciralight Global, Inc. is the undisputed leader in the daylighting revolution. Forward-Looking Statements Any statements contained in this press release that refer to future events or other non-historical matters are forward-looking statements. Ciralight Global, Inc. disclaims any intent or obligation to update any forward-looking statements. These forward-looking statements are based on the reasonable expectations of Ciralight Global, Inc. as of the date of this press release and are subject to risks and uncertainties that could cause actual results to differ materially from current expectations. The information discussed in this release is subject to various risks and uncertainties, results of operations or financial condition, national and international government regulations and the risks associated with doing business across borders and territories, and such other risks and uncertainties as detailed from time to time in Ciralight Global, Inc.'s public filings with the U.S. Securities and Exchange Commission.